I have been working on the Darcy cardigan from Kim Hargreave's Heartfelt: The Dark House Collection. (Isn't that a strange name for such a beautiful collection of designs? I guess the idea is to sound romantic.) This sweater is eating yarn. It is knit entirely in moss stitch, which has the basic elements of a rib due to the alteration of knit and purl stitches. The resulting fabric is both firm and stretchy in all directions. I am glad that I chose wool for this fabric. It would be hella heavy in cotton. 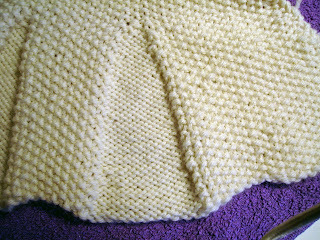 Here is how the bottom of the front looks with its knit-in pleats. I like how the edges are firm without having to work an edging. There is always the opportunity to mess up on an edging. The most interesting and educational feature of this design is the flounced and pleated bottom. That's right. It isn't just pleated, but the bottom edge is uneven because it has short rows in it. The edge dips lower in the back and at the sides where the sides meet the back. The edge goes up at the center to reach its highest point. In this photo the dip is on your right, the center edge on the left. This whole concept of pleats in a knitted fabric is new to me and opens up design ideas. Note that in this design the outer fabric of the pleat is moss stitch and the inner part is in reverse stockinette. Here is the pleat opened up so the inside and structure are more visible. The pleats are just sections of reverse stockinette that are gradually decreased away. Oddly enough, in her latest blog post Norah Gaughan describes a design for a swingy sweater using inserts that she calls godets to add fullness to the bottom edge. In the sketch of this design the godets look a lot like these pleats. According to Norah, the godets were much too heavy and saggy for the design to be workable, so she revised it, cutting off the bottom. The yarn specified for this design was Berroco Linen Jeans, a tape yarn made up of 70% rayon and 30% linen. I have never knit with this blend, so I don't know its weight. I would think it lighter than cotton, but maybe not so light as wool, with less elasticity. 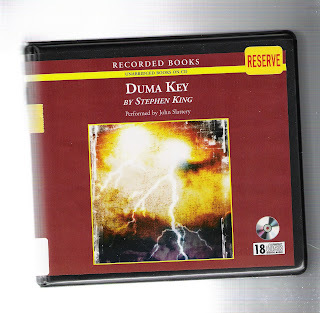 New Book: I finished the Jane Smiley book I was listening to and have started Duma Key the latest novel from Stephen King. I don't read King a lot, but I like him because he knows what's scary. I think The Shining and Misery must be the scariest books ever written. Lately I think King has become a better writer in the mainstream way, but less scary. At least so far I haven't been scared out of my wits by this book.